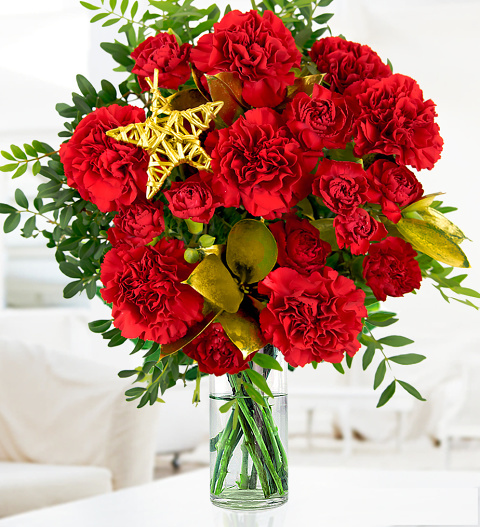 Our Christmas Star bouquet is an enchanting festive arrangement with cheerful sprays and carnations complimented with golden blossoms. A true festive favourite that is perfect for Christmas. Each Christmas Star bouquet comes with a FREE box of delicious Belgian Chocolates and is available for UK next day delivery. Please note the carnations are sent to be as fresh as possible to be enjoyed throughout Christmas so may be tighter than the ones shown in full blossom. Remember to trim the stems and arrange in a vase for maximum impact.